Blue and white striped Polo Ralph Lauren shirt. 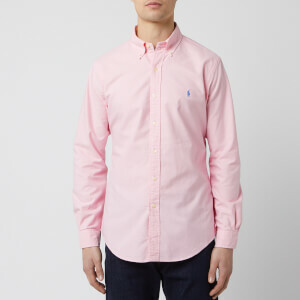 Crafted from stretchy cotton poplin and cut for a slim fit, the shirt is detailed with the brand’s iconic embroidered pony logo on the left chest, a classic button-down collar and buttoned cuffs. Complete with a curved hem and a rear centre box pleat.